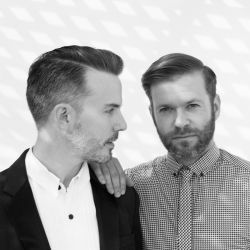 Co-founders of multidisciplinary design studio Dougall Paulson, Sean Dougall and Andrew Paulson seek beauty through new forms of sculptural objects, furniture, lighting, and textiles, as well as interior experiences, branding and graphic identities, and art direction. Using narrative as the thread that binds ideas together, their unique take on visual storytelling is the starting point for the creation of objects that straddle the fine, decorative, and graphic arts. Based in the foothills of the San Bernardino Mountains, Dougall Paulson approaches their practice with a focus on curiosity and discovery.